Following its debut last year in Hong Kong and the successful sessions held in Europe and America last Spring, Ferretti Group Service University was back to the Asia Pacific last week for its 2015 edition. The professional training and refresher course targeted at all authorized service network operators was held from 6th to 10th July at the Grand Copthorne Waterfront Hotel. This year’s training activities - attended by more than 20 professionals representing 7 Asia Pacific countries (China, Singapore, South Korea, Japan, Thailand, India, and Indonesia) - were aimed at increasing the skills and professionalism of the Group’s service network resources through classroom activities and visits to the local premises of the main technical partners. Starting in the 1990s, Ferretti Group has organized a number of training activities targeted at dealers and service points, so as to always offer Owners an outstanding level of service worldwide. In 2010, the Group decided to add to the existing Service University sessions, held in Europe, on-site activities also in the Asia Pacific region (APAC) and in the Americas. This means that, besides the traditional courses targeted at these markets held in Italy, dedicated courses are now being held on site in these two areas, thereby ensuring a strong local presence also through a better understanding of these regions’ specific needs and peculiarities. The training course in Singapore, organized by Ferretti Group’s After Sales & Service team, was held over five days and included both theoretical and practical sessions. Classroom lessons of outstanding technical value were given by the experts representing the Group’s partners Besenzoni, Seakeeper, ZF, MTU, and Kohler. Guided tours of MTU’s and Kohler’s Asia Pacific head offices, which are just in Singapore, were also organized for all Service University attendees. Special test benches were also set up in the classroom, allowing the participants to perform practical troubleshooting tests. Specific aspects regarding onboard systems and their maintenance were also dealt with during the lessons. The yard Filippetti Yacht is now defining a series of changes aimed to improve the supply and the fleet of its yachts. The news from the shipyard will be officially revealed during the Cannes Yachting Festival. This is a very important moment for Filippetti Yacht: six years after its founding, the shipyard led by Giovanni Filippetti, is developing a series of actions aimed to improve the offer and the fleet of its yachts. The new business strategy will focus on three key concepts: the range structure for requirement of navigation, customization, the expansion of the sales network and new models, which will be unveiled by Filippetti during the boat show in Cannes. The shipyard Filippetti Yacht builds only a selected and limited number of boats: the design skills and the handcrafted know-how enable the customization of yachts with solutions that are tailor-made and designed on customer requests. A recent example is surely the M/Y Gatsby, a magnificent navetta 30-meter, on which has been performed a custom job, in synergy with the needs of the owner. Middle East governments should consider easing restrictions on travelling between states to boost the region’s tourism industry and support the fast-developing yachting and cruise market, saysMohammed Hussein Al Shaali, Chairman of the UAE-based yacht and boat builder, Gulf Craft. Dubai received more than 500,000 cruise visitors last year – compared with just 10,000 in 1998, according to General Directorate of Residency and Foreigners Affairs (GDRFA) statistics cited by the Emirates News Agency – and the UAE market has been boosted by changes in regulations last year that allow cruise tourists to get a multiple-entry visa for all UAE ports in their itinerary. Regional tourism industry members have long campaigned for a Schengen-style system that would allow visitors to GCC states to enter any of them under a single visa. The regional yacht manufacturing sector also faces significant infrastructure challenges, such as lack of berthing spaces, especially for larger superyachts, and the need for greater focus on industrial development, Al Shaaliadded. While interest in yacht-ownership is rising in the UAE and across the GCC, there is a need for businesses to provide related products and services to support the sector. The UAE is ranked among the top 10 yacht building nations, with Gulf Craft leading the yacht-building industry both regionally and globally. While Gulf Craft focuses on the local, regional and international market sectors, the latter will make up 42 percent of its overall market this year. Sarasota, Fla., couple Chris and Laura Jessen began their fishing career targeting tarpon in the popular “holes” on the state’s Gulf Coast. They owned a series of smaller, outboard-powered boats, but never experienced the thrills of big-game fishing offshore until they took a trip to the Tropic Star Lodge in Piñas Bay, Panama, in 2008. A few years later, the Jessens were ready to move up to their first convertible. Needing a little more space onboard, the couple ultimately ordered a new GT63. They took delivery of Fish Tank in January of 2012, and headed right out after the big game. After that, Fish Tank went on her own bottom to the Dominican Republic, where the Jessens hunted blue and white marlin for two successful seasons. Their biggest blue they have caught from Fish Tank to date was 550 lbs. Chris and Laura typically release any billfish they hook, and just keep the fish they are going to eat. An avid photographer, Chris began posting the shots he took from the Hatteras on the Fish Tank Sportfishing Facebook page he created and shared with friends. By late June, 2015, when we interviewed Chris for this article, the Jessens’ Facebook page had nearly 6,000 followers. 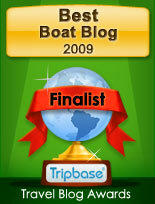 This season, Fish Tank is based in Costa Rica, with Capt. Ben Horning of Palm Beach at the helm. The couple flies down to join their Hatteras when they can. Chris reported in June that he, Laura and the Fish Tank crew already had caught 38 blue marlin, 1 striped marlin and 139 sailfish in Costa Rica this year – and that total no doubt has increased by the time you read this. A huge congratulation to the Jarrett Bay 77 Mama Who in taking home the Bermuda Triple Crown trophy! This esteemed accomplishment was partly achieved by the great skills of Lainey Jones winning Top Lady Angler for the team during the Bermuda Billfish Blast and junior angler Sales de La Barre being recognized as Top Junior Angler in both the Bermuda Big Game Classic and the Bermuda Sea Horse Anglers Club Tournament, where team Mama Who took second place with 2,000 points in a field of 260 anglers. Princess Yachts International plc have welcomed back some of the original experts behind Project 31, the model which launched the company in 1965, to share their insights and memories, and to guide the unique restoration of Project 31@50. Colin Grills was among the first employees at Princess Yachts, then known as Marine Projects. His initial reservations about working with fibreglass hulls, having been apprenticed in building traditional wooden boats, soon changed upon joining the company. He progressed to management early in his career and remained with the company until his retirement, aged 60. Peter Moore joined Princess Yachts in the late 1960s building Project 31s and went on to enjoy a career that spanned more than 30 years, becoming manager of one of the company's manufacturing sites before retiring. The Project 31@50 team are carefully restoring this icon of Princess' history to return her to her former glory while incorporating some of the advancements of modern shipbuilding to uplift her for today. Colin and Peter along with former colleagues Dave Cotter, Eddie Rawle and RP Kerslake, have returned to the shipyard to share their knowledge with the team. The unique restoration of Princess Yachts' original model is bringing together individuals at all stages of their careers. Also working on Project 31@50 and just beginning their careers are apprentices Callum Wilkinson, 19, and Sam Bridgeman, 21. Before joining Project 31@50 Callum, a 3rd year Apprentice Engineer, had been working on the latest M Class development, the Princess 35M. Princess Yachts offer apprenticeships in engineering, carpentry/boat building, development and fabricating and welding in partnership with the City College Plymouth. Princess work closely with the College to support the training and employment of young people in the marine sector. Sam, a 4th year Apprentice Carpenter, is due to complete his apprenticeship later this year. While enthusiasm is still lingering in the air for the fabulous première held last May in Monaco, the Riva 88’ Domino Super is already celebrating its first achievement: just a few weeks after its official launch, Ferretti Group announces the sale of the first 3 hulls of the new Riva coupé yacht. The three yachts have been sold in three different markets, showing how the 88’ Domino Super has been welcomed enthusiastically at an international level: the first hull will go to an owner from continental Europe, the second one will be delivered in the Asia-Pacific, meanwhile the third will cruise across Middle-East seas. These are the first positive results of a commercial strategy aimed at confirming the leadership of the Ferretti Group’s most iconic brand across the world. The relaxing and rewarding lifestyle on offer when you purchase a brand-new Riviera luxury motor yacht is now available to those with a passion for boating but find their time to spend out on the water is limited. Boating Partnerships will appeal to those who have limited time but who have a genuine passion for luxury lifestyles and world-class motor yachts, and who wish to share the ultimate boating experience with families, friends or business colleagues. 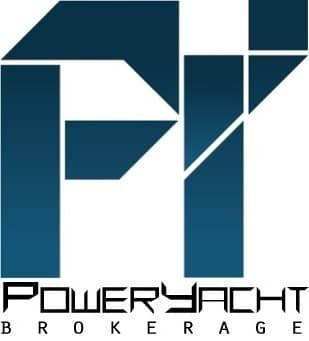 The only syndication service with the official endorsement and support of Australia’s favorite and most awarded luxury motor yacht manufacturer Riviera, Boating Partnerships shares the purchase and monthly maintenance of a brand-new Riviera or Belize motor yacht with up to six like-minded partners. Riviera brand and communications director Stephen Milne said Boating Partnerships was a fantastic opportunity for those who appreciate the supreme levels of luxury, superior sea-keeping capabilities and state-of-the-art marine technology that are hallmark features of a world-class Riviera to enjoy all the rich and rewarding benefits of boating. 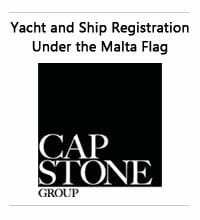 Mr Milne said each shareholder under the new Boating Partnerships arrangement will enjoy all the benefits of being part of the global family of Riviera luxury motor yacht owners, as well as the unrivalled aftermarket support of the nationwide R Marine Network of Riviera and Belize dealers. Boating Partnerships managing director Tom van Vliet said the program offered many new and exclusive benefits to boating enthusiasts who were looking for a premium concierge-style syndication ownership that allowed for more time on the water. Mr van Vliet said a professional crew will maintain each Riviera in premium condition for the ownership period, and the annual maintenance, slipping and berthing costs are affordably shared between the yacht’s owners. Mr van Vliet said the first Riviera yachts available under the new partnership program would be the sporty and adventurous 445 SUV model. Mr Milne said the full benefits of Boating Partnerships new luxury motor yacht ownership will extend to Riviera’s educational workshops and seminars, to exclusive invitations to Riviera’s spectacular social events around the world, as well as to the marque’s special Experience voyages cruising in company of fellow Riviera owners to idyllic destinations. When Sea Ray sent its flagship L650 Fly on a coastal tour last summer, it was making a statement: The L-Class represents a new paradigm for Sea Ray and for boating in general. A yacht of this caliber deserved a sophisticated debut, and that’s precisely what it received. This year, the L-Class Coastal Tour enjoyed its second chapter, this time featuring the latest addition to the L-Class fleet: the sleek, beautiful L590. After traveling up the East Coast of the United States, stopping in several major ports of call to headline invitation-only gatherings, the L590 touched down in New York for two final events. On June 25, the yacht graced Chelsea Piers; two days later, it concluded the tour with a party in Sag Harbor. Each event on this year’s L-Class Coastal Tour was held at an exclusive waterfront venue where invited guests could take their time enjoying not only the L590 and educational information from industry suppliers including Cummins, Raymarine and KVH, but also offerings from several carefully selected luxury goods providers. The New York City and Hamptons venues; Chelsea Piers’ Current restaurant and Sag Harbor’s Breakwater Yacht Club, respectively were outfitted by Timothy Oulton. The British furniture designer lent his flair for coastal chic, adorning the spaces with stylish vintage and handmade pieces evocative of the sea. In addition to the contributions of Timothy Oulton, the L-Class Coastal Tour was sponsored by an exclusive group of luxury brands, including Aston Martin, showcasing its latest offerings of renowned sports cars; Louis XIII de Remy Martin, providing tastings of its superlative aged cognac; Champagne Thiénot, serving fine wines and champagnes; Montecristo, offering premium cigars; and the William Grant Group, featuring Glenfiddich single malt Scotch whiskies. In all, the 2015 Coastal Tour reiterated Sea Ray’s dedication to elevating the customer experience, both on and off the water. The end of summer 2015 will be marked by the return of the ever-popular Sunreef power catamaran DAMRAK II to the Atlantic. Her travels have taken her to the exotic shores of Asia and the Middle East and starting this September, the highly-rated and award-winning charter yacht will be inviting guests to enjoy the splendor of the Bahamas. Soon after, the Caribbean will become her playground where she will be chartering for the winter. The 26th Annual Viking Ocean Showdown proved to be another fun filled event in the picturesque town of Cape May, New Jersey. The Viking Yacht team took home the perpetual trophy but both teams left as winners after a jovial pool party at the Canyon Club Resort and Marina, two days of fishing in sun kissed seas, endless parties and plenty of laughs. Congratulations to Captain Brian Komer and his crew on Patrick Healey's Viking 62 taking Most Point Overall with six whites and one blue marlin. Also on the leaderboard was Kurt Von Seekamm and his team on the Viking 52 Marlin Hunter claiming Most Points White Marlin and Sam Ehret with Top Junior Angler. Jack Beittie took home the Heaviest Dolphin with a 30 pound fish while onboard John Siedzkowski's Viking 45 Decked Out. Kenny Chesney just released his new music video Save it for a Rainy Day to rave reviews and we think we know why. The video, with the catchy tune celebrating life, was filmed in the exotic Bahamas on none other than a beautiful Viking 45 Open. Kenny is certainly a star but don't you think the boat steals the show? Check out the video here and don't miss the cameo by the owner's chocolate lab. Viking Health Services department was recently recognized in a state wide competition as a Workplace Wellness Hero by NJBIZ, a weekly news organization, which covers a variety of business happenings throughout the Garden State. Viking has maintained its health services department for more than 26 years providing medical care and support for its employees and their families, as well as community relations work for residents of New Gretna. Under the direction of nurse practitioner Steve Marks and his staff, including therapy dog Bridgette, Viking's Health Services was honored with the prestigious award for the significant impact that it provides on the quality of health care in New Jersey. The fourth and final day of June's International Cap Cana Shootout in the Dominican Republic was a wild one. With releases being called in regularly amongst the fleet of 20 boats it was the Viking 52 Prime Time that shook things up. At the end of the final day, Prime Time released five white marlin and leap frogged from fifth to first place in the Dewar's Division. This pushed the Viking 62 Uno Mas to second place. Uno Mas angler Brooks Smith repeated as the tournament's overall Grand Champion having won the same honors in 2013. 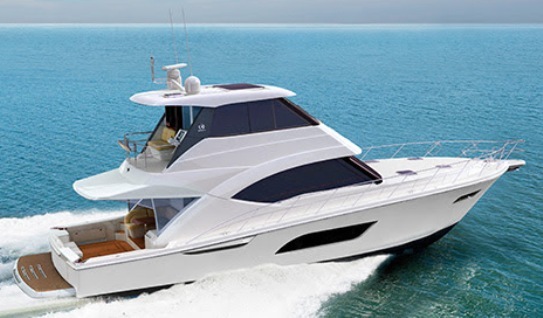 Ocean Alexander has recently revamped its entry level line up, and today this new for 2015 72 Pilothouse is its start up model. The 72 Pilothouse represents Ocean Alexander at its best, with interesting options making life on board easy for the guests and crew. With this new model Ocean Alexander is targeting the owner operator. The 72 Pilothouse is offered with a standard three double cabins layout, and optional four cabins version, this last changing the layout of the staircase which leads to the guest rooms and eating a bit from en-suite in the VIP room. Owners room is at midships and offers a private stair case entrance from the middle of the saloon on the main deck. Another option for the 72 Pilothouse is the enclosed bridge Skylounge version. Power comes from twin Cats 1150hp engines with max speeds of 22 knots, and a cruise of 21. 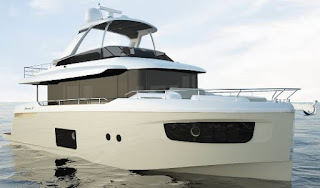 Princess present a new project the V58 Open set to launch coming September at the Southampton boat show. Open for those who enjoy making the most outdoors, from al-fresco dining to soaking up the sun and diving into the sea, this new V58 is in Princess words is a next generation model in its V-series high-performance sports cruisers and yachts range. In reality the V58 Open could be the next model for a client which trades up from the V48 Open launched a couple years ago. The sleek new exterior styling with large hull window forward, floods the lower accommodation with light and provides breathtaking sea views from all three cabins. Her open main deck creates a fabulous space to enjoy time together with friends and family set on one level with an expansive seating area aft around a teak table. Companion seating forward, adjacent to the twin helm station, and a large sun-pad aft complete the plentiful options to enjoy the Open boating experience. The Super suffix have been used by Riva since many decades to mark an evolution in its species. This time around it is for an important model in the Riva range the 88 Domino Super. Super this time around stands for four important design improvements; fore sundeck, helm station on the sport bridge, updated windows, and a rethought aft area. The most noticeable feature will be the hull side glazing now extended to a much larger size, while the one which will receive most accolades from customers is the redesigned now not only spacious but also functional fore sun-deck. The 88 Domino Super will have a big challenge to follow, twenty hulls have been sold of the standard version. Premises look there since Riva sold three units in the first month since the 88 Domino Super has been in the water. 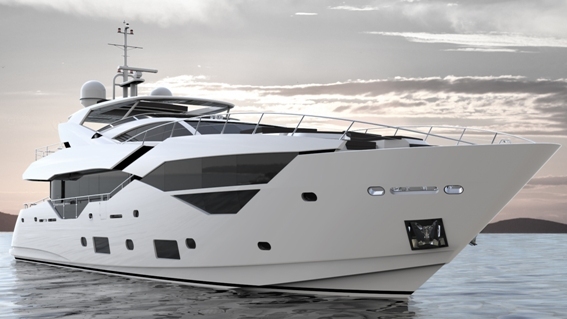 The newest member of Riviera’s collection of flybridge luxury motor yachts comes in the new 57 Enclosed Flybridge which will make her World debut at the Sydney show in Australia at the end of this month. Stylish, and sophisticated the three-stateroom two bathroom 57 Enclosed Flybridge will feature a full beam master stateroom, and a fresh-thinking design to her state-of-the-art navigation systems, and right through to her final fit-out and luxuriously polished finish. The new 57 Enclosed Flybridge will also include features as the innovative Volvo Glass Cockpit navigation and CZone digital switching systems. The Riviera 57 Enclosed Flybridge will feature a propulsion choice of IPS pod drives or line shafts. Engine choices come from standard twin Volvo 725hp, or optional 900hp units available in both shafts or pods. Jeanneau and designer Tony Castro decided that it was time to make a light improvement to the 43 Velasco. Here comes the F version which differentiates from the standard 43 Velasco with an integrated radar arch replacing the mast on the fly-bridge, and adding to this softer lines and forward-sloped windscreen, defining in simple terms a new model. Traditional shafts propel the 43 F and an interesting main deck layout with galley to port side of the helm station compliments a traditional lower deck plan with forward owners room. Power comes from twin Cummins 380hp. After the very positive input on the first Absolute Navetta the 58, it is not surprising to see the Italian builder follow it with a slightly smaller model a year later. The Absolute 52 Navetta continues where the 58 left us, albeit a slightly smaller size, and follows in five feet less with a similar concept inside, outside, and on the technical side. The accommodation plan will feature three double cabins, full beam owners room at midships, VIP forward, twin berth cabin to starboard, and a guest head to port side. To aft is a crew cabin with private head. The main deck will feature an astern galley, while two steps up to port side of the helm station is a C-shaped multi purpose dinette. Power for the soon to launch Absolute 52 Navetta will come from twin Volvo 435hp with IPS 600 pod drives. The Worlds biggest motor boat producer Sea Ray updates its website to a new platform. Founded in 1959 by C.N. Ray this World known US builder was one of the first to start fiberglass boat production. In 1986 Sea Ray became part of the Brunswick Group, what is today known as the biggest pleasure boat holding. 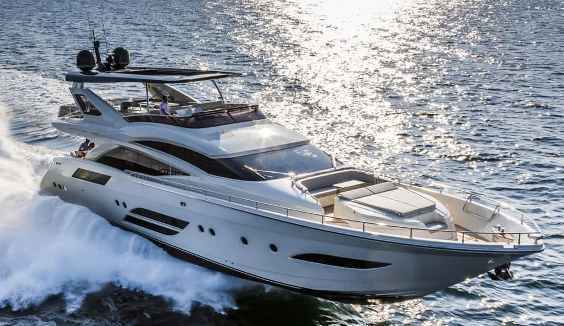 The current Sea Ray line up offers thirty seven different models from eighteen to sixty one feet in length, and is divided into four ranges: Sport Boats, Sport Cruisers, Sport Yachts, and Yachts. The new Sea Ray website is available in English, Spanish, Russian, German and French language and guides you with the following buttons; Sea Ray Models, Owners Resources, Find A Dealer, Build My Sea Ray, Why Sea Ray, Explore and Launch Pad. Sea Ray new web site also features direct links at the bottom to its social network hubs; Facebook, Twitter, Google Plus, and YouTube. Mulder introduces a new concept: the 2800 Raised Pilot House full beam. This 28 meter, round-bilge, all-aluminium pocket size yacht is easy to operate, suitable for both families and chartering, and possible to sail with a limited crew and low running costs. RPH stands for “Raised Pilot House”, which means that the wheelhouse is raised to a higher position on the vessel, giving the captain a better overview and allowing other valuable options regarding layout and usability in the interior. In this design “full beam” means that the saloon area has side decks, while the master suite forward on the main deck does take up the whole width of the yacht. This makes for spectacular views right out of the bedroom and a hugely enhanced feeling of privacy guaranteed by never having to worry about seeing crew members walking in-front of the windows. Another wonderful feature is the aft deck dining. The dining table is placed outdoors, under a sun-deck roof so that it would be out of direct sunlight, and we designed drop-down windows to port and starboard while completely concealing the main entrance doors. This resulted in a flush open deck floor plan of over ten meters in length. No steps or glass doors in-between means that the view is spectacular. The yacht is designed to accommodate ten guests and a crew of three, with the possibility for alternatives. The round-bilge, all-aluminium 2800 RPH offers an economical cruising speed of twelve knots and the option of achieving 15-16 knots or even more if required. Using aluminium instead of steel for the hull allowed fuel savings of up to 20% at low speeds compared to displacement speeds. Van Oossanen Naval Architects is responsible for the naval architecture of the Mulder 2800 RPH, Frank Laupman from Omega Architects designed the interior and exterior. Sciallino finally sets its future course with an important model in its completely new range by launching the SC36. The SC36 apart being the flagship of the range is the second model to launch since the new owners of Sciallino decided to revamp the line up with the help of designer Luca Machera. The SC36 is in standard version a 2 cabins sleeping four plus 2 in a convertible saloon on the main deck. 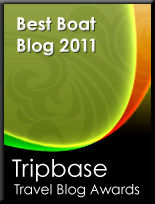 Alternative layouts include a third berth or an open plan layout. Power options start from a single Volvo 435hp, up to twin Mercury diesels of 350hp each. Propulsion is the over a century tried and tested line shaft. Bravo from Poland presents its second model the B36 Hardtop. Based on the B36 with the inclusion of a three part hard-top, the Hardtop version makes easy usage of this sport cruiser all year round being it rain or sun. While adding the three part hard top Bravo also thought to include other interesting elements as solar panels in order to make life on board easy. Cantiere Delle Marche 90 Nauta Air is a new step in this yards range, and unlike the more rugged and tug boat looking Darwin class takes a modern approach to the looks of an explorer. The design and original ingenuity of this project comes from the hands and cooperation between Cantiere delle Marche and Mario Pediol with Massimo Gino of Nauta Design and represents the union between a modern super-yacht style and the typical explorer seaworthiness. From a certain point of view this original concept starts on the consideration of life at sea. The accommodation plan on the 90 Nauta Air offers a four double suite arrangement, with a twin crew cabin aft. Power comes from twin 885hp Cat engines which give a max speed of 16 knots, cruise of 13, and an economic 9 knots. This last giving an impressive 3200 nautical miles range, which is for sure among the best in this size. Sunseeker has released the first exclusive CGI images of the eagerly anticipated new 116 Yacht currently under production in Dorset, UK. The stunning next generation super-yacht is set for launch in Spring 2016. Its elegant lines, open plan layout and stylish interiors showcase the new design direction that Sunseeker’s next generation of 100 feet and over models will take. It also underlines the group’s commitment to bringing more exciting new products to market, and continuing to invest in cutting edge technical and design innovation. The 116 Yacht shares the proven engineering platform of the hugely popular 115 Sport Yacht, but brings a spectacularly re-imagined new deck and superstructure design. The new images give a tantalizing first glimpse of the rakish looks and unique design layout that make it a super yacht for entertaining in style. In keeping with that theme, the fore-deck has been developed into a whole entertainment area of its own, with a new ‘Club’ concept and the option of a large hot tub. The fly-bridge itself boasts a huge retractable sunroof and an exceptionally generous seating and dining area, with space for a wet bar, sun-loungers, companion helm seating, and standard hot tub. An electronically operated carbon fiber gull-wing door also provides easy access for crew from the wheelhouse to the exterior side deck. Inside, the 116 Yacht’s most eye-catching new design features include larger and lower windows in the full beam master stateroom, creating bigger, brighter owner’s accommodation affording maximum privacy. Full height glass in the saloon also combines with sleek cut away deck bulwarks to flood the living accommodation with natural daylight, bringing an astonishing sense of size and space to the interior for a yacht of its size. The aft cockpit lounge area, bar and bathing platform is designed with a sociable ‘Beach Club’ feel in mind. Extra touches like the platform level seating and hidden platform shower give it everything owners and their guests need to relax and enjoy the water in style and comfort. The stern garage has plenty of room for a large tender and two jet skis. Based on the classic Sunseeker hull, the 116 Yacht still has performance at heart, and depending on engine options cruises at 16 or 18 knots with top speeds up to 26 knots. Standard guest configuration is for ten guests in five cabins, with up to five crew, but this can be flexed depending on the layout and options selected. Consistency is always key in a project, and Azimut since the launch of the 74 Magellano in 2009 has made it an important element for the range which today with the launch of this new 66 features a total of five models which start at 43 and end at 76 feet. Since fuel prices started going up in 2005 we have seen loads of dual purpose hulls from various makers, trying to capture the right balance of owner operating enjoyment of the journey and the arrival to destination. A big challenge which Azimut overcomes thanks to consistency in style and technical element and the expansion of the Magellano range. The new 66 is an important arrival to the range, which designer Cor D. Rover has managed to give a unique important identity in the exterior looks since he designed the second model of the range, the now stopped in production 50. Looking at details in the technical data one also notices how the Magellano project which with its first 74 model featured an international identity of designers, today is an all Italian affair, with Pierluigi Ausonio designing the semi planning dual mode hull of the 66 Magellano. Baglietto from Italy presents its new World wide web showroom. A legendary name of the boating and yachting World community, Baglietto founded 1854 in Varazze, by Pietro to which his surname gives the name to the brand. Pietro started as a builder of fishing boats in a small yard one hundred meters from the sea in Varazze, later on this was translated to speed boats in the early part to the middle of the nineteen hundreds, and special military boats of all genres. The early part of the twentieth century is one of various new records; in speed by Baglietto I in 1923, in height with a hydroplane in 1927, and in size with La Spina a 12 meter cruiser build 1929. In this period a lot of military boats are also build as well, from 16 and 21 meter class torpedo boats, to hydroplanes, and also hydrofoil prototypes. Baglietto also creates the MAS in its 15, 16, and 21 meters versions in the 1920s, still recognized today as superb design ingenuity. Baglietto in this period also gets commissions from places as Japan, and China to build there military boats. Baglietto will build military boats of various sizes and type for just less to ninety years, a career which apart various Italian orders includes others from Finland, Indonesia, Algeria, and United Arab Emirates. After World War II Baglietto starts the production of the wooden yacht series, with Elba, Ischia and Capri models. In the seventies and eighties Baglietto looks at aluminium to build boats, and launches the first in this material with the Nauta at 26.5 meters in 1976. In the nineties Baglietto expands its size and builds various super yachts over thirty meters and a couple of forty meters plus. Important names are the Al Fahedi in 1985 a 46 m steel build which will be the flagship up till 2006, and the Opus in 1994 a 28 meter open sport yacht which is to be the largest of its type for a couple of years. Baglietto was purchased by the Gavio Group in 2011 after a decade plus of ownership from Camuzzi. Currently Baglietto builds yachts on order with a line which starts with the timeless classic MV 13 up to the 62M Motor Yacht, with a portfolio which stands of eight super yachts currently in build. Baglietto new website is available in Italian and English language and takes you around with the following buttons; About Us, Yachts, Shipyard, Baglietto World, Contacts and Site Map. Baglietto has also its social hubs; Facebook, Instagram, and Youtube accessible at the bottom of the page. Privateer from Holland presents the project for a new 74 Trawler, which sits in between its 65 and 84 flagship models. Coming with a two deck platform and lightly raised pilot house the Privateer 74 Trawler will offer an interior with three double cabins, of which to forward is a spacious owners stateroom. A Portuguese ship like bridge surrounds the lower pilot house. It will be a spacious explorer yacht build of steel and showing sensibility to long stays on-board is the large utility room at midships. The 74 Trawler will feature two main exterior entertainment areas; aft and an expansive fly-bridge. The flybridge helm features a direct internal stair case access making communication between the two driving stations easy. The new Dominator 800 is a natural evolution of the 780 and is a further example of this Italian yacht builder tailor made philosophy. This 24.5 meters long pocket size super yacht combines stunning exterior design with the latest technology in operating systems and propulsion. The state-of-the-art building methods have saved weight and maximized the inner space. The carbon hardtop is not only a striking feature but also extremely functional providing shade when needed. With a retractable inner section, those seeking the sun can also get their wish at the press of a button. 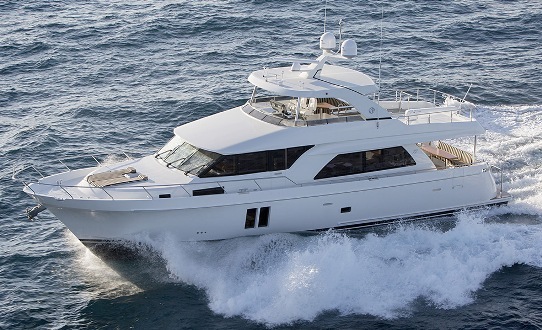 Sleek and sportive in design, this is the largest flybridge hardtop on a 80 foot yacht. The 800 offers an interior layoout with four double guest cabins; owners stateroom at midships, and two different layouts offering one or two VIP cabins. With an extra port side located VIP suite in the proposed layout B. Crew cabins are two at aft plus a shower head in between. Power comes from standard MAN 1550hp to optional 1800hp units. Riviera presents the project for a new 52 Enclosed Flybridge model, which takes the competition in an interesting way with some elusive features rarely found in a seventeen meter cruising motor yacht. 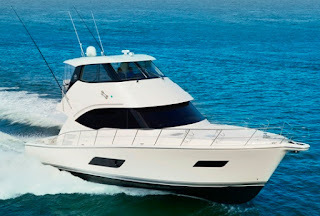 The 52 Enclosed Flybridge is a further evolution of the 50 model launched in 2013 with Rivera pushing the boundaries on latest technology, extended range with among the largest fuel tank capacity of the category, and an updated layout which centers around the glass cockpit. The 52 Enclosed Flybridge will feature three double cabins, and a choice for a master stateroom forward, or at midships to port side. 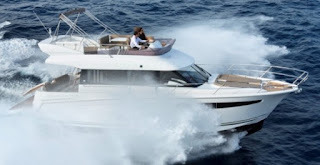 Power comes from twin Volvo 725hp with IPS pod propulsion and a top speed of 32 knots. In the start of 2015 Bertram was purchased by Gavio Group, a company which in past recent years also purchased Baglietto and Cerri. It will be interesting where Gavio will take Bertram and who the helm will be given too. Can the flying eagle fly high again as it did in the sixties, seventies, and eighties. As a company Bertram at today still pays two heavy prices of its long standing history. The first came from the the luxury tax of the early nineties, the second comes from the various owners who owned the brand in the nineties. Ferretti Group brought a certain solidity to the company in its over ten years of ownership from 1998 till 2014. But the Italian Group failed the flying eagle in the quality department, something which was the boasting of any Bertram owner. Gavio is not showing his intentions yet, we have a provisional website with history and owners writing support lines to the brand, and for the most part many are asking they want the original strong indestructible Bertram back. The recent Ferretti Group project with the 60 by renowned custom sportfish yacht designer Robert Ullberg was a step in the right direction to what Bertram needs to do.